First off, I’ll admit to having enjoyed the movie. This opinion/review will not concentrate on the merits of the film per se, but rather take a swing at the broader picture—pun definitely intended. The truth is Rogue One is a well-acted, slightly better plotted than other entries, and with acceptable special effects. Okay, that star destroyer did look like made out of white Lego plastic, and I wasn’t impressed with CGI Tarkin or Leia; but other than it was fun to watch. Darth Vader is a scene stealer, and that last confrontation in the dark hallway alone is worth the price of admission. 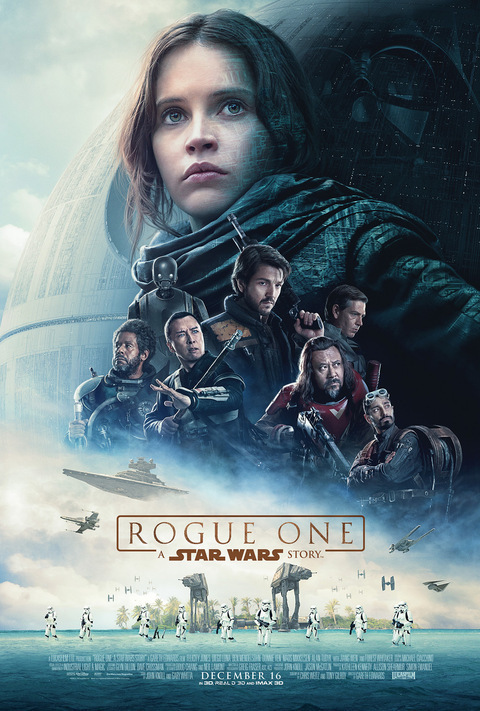 As an individual film, Rogue One could not stay on its own. It is the eternal curse of the spin-offs being dependent on the audience being familiar with the original story from where they come. Still, as part of a larger franchise it is somewhat of a departure from the canon Episode movies. First off, the cast includes some popular and familiar authors. Okay, they are not power-superstars with a $20 Million paycheck, but Diego Luna, Felicity Jones, Mads Mikkelsen and Forest Whitaker are hardly the unknown cast that Mark Hamill, Natalie Portman, Hayden Christensen, Daisy Ridley or John Boyega were before their Episodes hit the screens. Also, the flick is somewhat of a throwback to the old kind of moviemaking, focusing more in the story rather than the special effects. When the original episodes were released in 70’s and 80’s, the effects did dazzle, but they only served the purpose of telling the story; whereas Episodes I through III suffered from the vision of man who just wanted to show off what the new technology could do, and thus Rogue One falls closer to the original mark. Although an entertaining movie, I question its reason for existence. The story tells nothing new, but expands on details of things we’ve already learned. This experiment was not really necessary, just like the now common practice of splitting the last book of a franchise into two movies just so we could pay double the amount of tickets and have to buy two videos instead of one. This sad tradition started with Harry Potter and the Deadly Hollows and will not stop until people stop making those flicks blockbusters. Law of offer and demand, remember? This movie is the result of what I like to call the “Disney Treatment.” A few years ago when Disney bought Marvel, we got so many different TV series, movies, cartoons, and games even before the ink had dried off. Because of tricky licensing deals they couldn’t put all the characters into one film, but nothing stopped them from making it happen in a cartoon series for Disney Channel. I had a bad feeling about this. I feared something similar would happen to Star Wars, a franchise that featured a movie every three years, then take a 20-year holiday in between. Now that Disney owns Lucasfilm we can see Star Wars literally everywhere, from the Rebel series on TV, to the standard Episodes, but wait, we ain’t seen nothin’ yet! New movies in the form of “A Star Wars story” are lined up, I understand there are plans for more spin-offs, like from a young Han Solo, etc. Disney will continue to commercialize the franchise by inundating the market with products that would appeal to all ages, genres and even tastes. As long as they continue to create quality products the trend will stay healthy for years to come. Well, I’m curious to find out how they plan to resurrect the most popular character despite its short screen time: Bobba Fettt. Now, that’s a ticket I’d buy. PS: A mourning note as I just learned of Carrie Fisher's death. May the Force be with her.